Ooohhh, bubbles! Our bubbly mint choc Muscle Mousse is a firm favourite with mint lovers everywhere. With 30g of slow-release protein per serving, you can enjoy your bubbly mint choc protein mousse any time of day – yes, even before 8pm – or after; we’ll leave it up to you! Add 50g (2 scoops) to 150ml water in a shaker bottle (can also be mixed in a bowl with a whisk) and shake vigorously for approximately 20 -30 seconds. Pour in to a bowl and allow to set (preferably in a refrigerator) for a minimum of 30 minutes, enjoy. 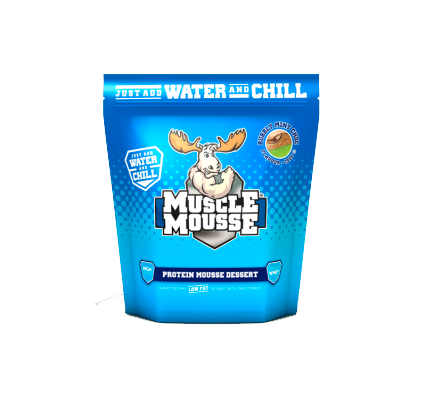 Once mixed Muscle Mousse® dessert must be kept refrigerated and consumed within 48 hours. Protein Blend: (Milk Protein Concentrate (MILK), Whey Protein Concentrate (MILK), Egg Albumen (EGG)), Reduced Fat Cocoa Powder, Gelatine, Flavourings, Waxy Maize Starch, Leucine, Sweeteners (Sucralose, Steviol Glycosides), Sodium Chrloride.